• Drive cautiously and allow extra distance for braking. • Avoid sudden braking or steering. • When braking with non-ABS brakes pump the brake pedal with a light upand- down motion until the vehicle is stopped. • If stalled in snow, mud, or sand, use second gear. Accelerate slowly to avoid spinning the drive wheels. • Use sand, rock salt, or other non-slip material under the drive wheels to provide traction when stalled in ice, snow, or mud. WARNING - Downshifting Downshifting with an automatic transaxle, while driving on slippery surfaces can cause an accident. The sudden change in tire speed could cause the tires to skid. Be careful when downshifting on slippery surfaces. Reducing the risk of a rollover This multi-purpose passenger vehicle is defined as a Sports Utility Vehicle (SUV). SUV’s have higher ground clearance and a narrower track to make them capable of performing in a wide variety of off-road applications. Specific design characteristics give them a higher center of gravity than ordinary vehicles. An advantage of the higher ground clearance is a better view of the road, which allows you to anticipate problems. They are not designed for cornering at the same speeds as conventional passenger vehicles, any more than low-slung sports vehicles are designed to perform satisfactorily in off-road conditions. Due to this risk, driver and passengers are strongly recommended to buckle their seat belts. In a rollover crash, an unbelted person is more likely to die than a person wearing a seat belt. There are steps that a driver can make to reduce the risk of a rollover. • Specific design characteristics (higher ground clearance, narrower track, etc.) give this vehicle a higher center of gravity than ordinary vehicles. • A SUV is not designed for cornering at the same speeds as conventional vehicles. • Avoid sharp turns or abrupt maneuvers. • In a rollover crash, an unbelted person is significantly more likely to die than a person wearing a seat belt. Make sure everyone in the vehicle is properly buckled up. Your vehicle is equipped with tires designed to provide safe ride and handling capability. Do not use a size and type of tire and wheel that is different from the one that is originally installed on your vehicle. It can affect the safety and performance of your vehicle, which could lead to steering failure or rollover and serious injury. When replacing the tires, be sure to equip all four tires with the tire and wheel of the same size, type, tread, brand and load-carrying capacity. If you nevertheless decide to equip your vehicle with any tire/wheel combination not recommended by KIA for off road driving, you should not use these tires for highway driving. WARNING - Spinning tires Do not spin the wheels, especially at speeds more than 56 km/h (35 mph). Spinning the wheels at high speeds when the vehicle is stationary could cause a tire to overheat which could result in tire damage that may injure bystanders. Do not attempt this procedure if people or objects are anywhere near the vehicle. During the rocking operation the vehicle may suddenly move forward of backward as it becomes unstuck, causing injury or damage to nearby people or objects. Avoid braking or gear changing in corners, especially when roads are wet. Ideally, corners should always be taken under gentle acceleration. If you follow these suggestions, tire wear will be held to a minimum. Because night driving presents more hazards than driving in the daylight, here are some important tips to remember: • Slow down and keep more distance between you and other vehicles, as it may be more difficult to see at night, especially in areas where there may not be any street lights. • Adjust your mirrors to reduce the glare from other driver's headlights. 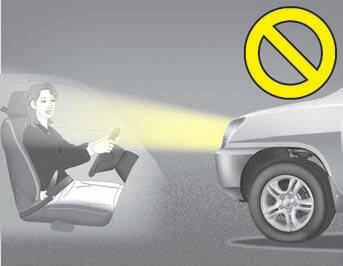 • Keep your headlights clean and properly aimed on vehicles not equipped with the automatic headlight aiming feature. Dirty or improperly aimed headlights will make it much more difficult to see at night. • Avoid staring directly at the headlights of oncoming vehicles. You could be temporarily blinded, and it will take several seconds for your eyes to readjust to the darkness. Driving in flooded areas Avoid driving through flooded areas unless you are sure the water is no higher than the bottom of the wheel hub. Drive through any water slowly. Allow adequate stopping distance because brake performance may be affected. • Underinflated or overinflated tires can cause poor handling, loss of vehicle control, and sudden tire failure leading to accidents, injuries, and even death. Always check tires for proper inflation before driving. For proper tire pressures, refer to “Tires and wheels” in section 8. Fuel, engine coolant and engine oil High speed travel consumes more fuel than urban motoring. Do not forget to check both the engine coolant and engine oil.